The war of words between President Trump and 'everyone else' continues to heat up, with market conniptions managed for now by Kudlow's "good cop" headlines to Trump's "bad cop" histrionics. In his latest salvo in the trade war, following China's 'fight them on the beaches' rhetoric, Trump turned his attention to the World Trade Organization, lambasting their lack of action as "unfair." US President Donald Trump's latest threat to impose tariffs on an additional $100 billion in imports from China was quickly rebuked by China's Ministry of Commerce and Ministry of Foreign Affairs in a more resolute way. The two ministries said China will listen and observe what Washington will do next, while showing contempt to the unreasonable US. They said China will fight to the end at any cost, which is an unusual response. We Chinese do disdain that Washington, which is in no position to initiate a trade war with China, persists in wielding the tariff baton. We are fully able to inflict as same losses on the US as those on China. 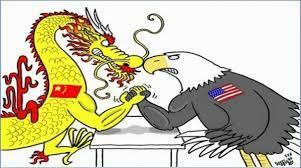 The US will have to repay whatever loss and harm it has caused on China with huge economic and political cost. The White House's latest proposal will hit Chinese exports to the US, and in response China will make a sweeping counter attack at US exports to China. China can retaliate at a wide range of areas including US goods exports to China, service exports and the US' highly profitable investment in China. It takes both strength and willpower to engage in a large-scale China-US trade war. While the two countries are about evenly matched in trade power, the future is on China's side. The trade war will cause pain for China, but in the meantime it can force China to speed up its economic transformation. What the US is losing in this process is its future. Many leading US companies will lose the Chinese market and thereby lose their edge. The US' modern agriculture industry will be dealt a heavy blow. China won't back off. The Chinese society will unite around the Party and the government to weather through the hardships, which is unparalleled for the US. More importantly, in the trade war launched by the US, China is on the righteous side safeguarding multilateral trade rules and our own rights on this basis. Chinese are aware that the only option now is to hit the US hard enough so that it will remember the pain. Otherwise Washington will go more recklessly and cause more losses. When Zhu Guangyao, China's vice finance minister, and Wang Shouwen, vice commerce minister, announced proportionate tariffs on $50 billion US goods exported to China at a press conference on April 4, the short video got more than 2 million likes in two days. That is how Chinese people feel. It is not only the Chinese government's decision, but the choice of society to firmly strike back against the US pressuring moves at any cost. Chinese society has been mad at repeated threats from the US in these years. Even if the Trump administration wants to take the trade war to the direction that bilateral trade and investment is suppressed to zero, China will meet all the challenges. Based on information we have received, Chinese authorities have made detailed response plan with many specific measures. Relevant Chinese government departments are fully confident in our ability to hit back at Washington, safeguard China's interest and defend the multilateral system. Most Americans have their life linked with China-US trade. As the tensions escalate, we want to expand the trade war to all Americans so that they have to choose whether to support Trump's unscrupulous move or to hold the president accountable.